I had the chance this past week to chat with Linda a bit about the book, her writing process and everything from critique groups to bent spoons to Cover Your A** writing. A little warning: It’s a long interview. I just didn’t have the heart to cut a whole lot of it and you wanna know why? There a little gems of writing genius scattered about every other word throughout the interview. So I wanted you to be able to take advantage of the whole thing. Call me a poor editor if you want, but by the time you finish reading the interview, you’ll be singing Linda’s praises, just as I am. And you’ll be dying to read A CROOKED KIND OF PERFECT for the first time –or the second, or third, or twentieth — just as I am. I’m excited about this book. Really excited. Excited enough to use a million exclamation points. But as Zoe from A CROOKED KIND OF PERFECT says, “Never trust an exclamation point.” So you’ll just have to go see for yourself. What do you do when you hit the wall, when you’re writing along and the story doesn’t just spool out and let you follow where it leads? I write best when I write often. I’ve never been able to do every day, but I have done five days a week and those sessions have been the best. Kate DiCamillo says that showing up is the hardest part. When I show up regularly, something usually follows. In principle, one should be able to write exploratory crap until the right stuff comes, but I have a really hard time with that. I guess there are different kinds of crap.Crap just for words on a page doesn’t work for me. I have to write something that at least has a chance of making it to the final product. I have to feel like I’m at least laying a foundation for something better. When I put down just anything, just to have done with it, I end up with a shaky foundation and things topple. Right now, I’m at a rough patch in my WIP. I’m probably at about the 2/3rd mark. I know where the thing needs to end, but I can’t seem to get there. How to get these kids to the point where the end makes emotional sense? But I’m showing up. And this morning I got a glimmer of something — not gold nugget, surely, but maybe a bent spoon buried in the dirt. That’s okay. There’s a lot you can do with a bent spoon. I have, at times, over the last year or so participated in Poetry Friday. I always look forward to Fridays, to seeing what poems are posted, to recognize a few I’ve loved and to fall in love with a few I’ve never seen. But I don’t always post an entry on Poetry Fridays because I talk myself out of it. I do think I have a fair to middling knowledge of children’s poetry (and poetry in general), but my immediate access to poetry is limited to the books I have here in Brazil, or to poems I can find online. And often, I’m a couple of months behind receiving the new releases. So I feel a little goofy sharing a poem or a book that I know someone else has already shared or reviewed. 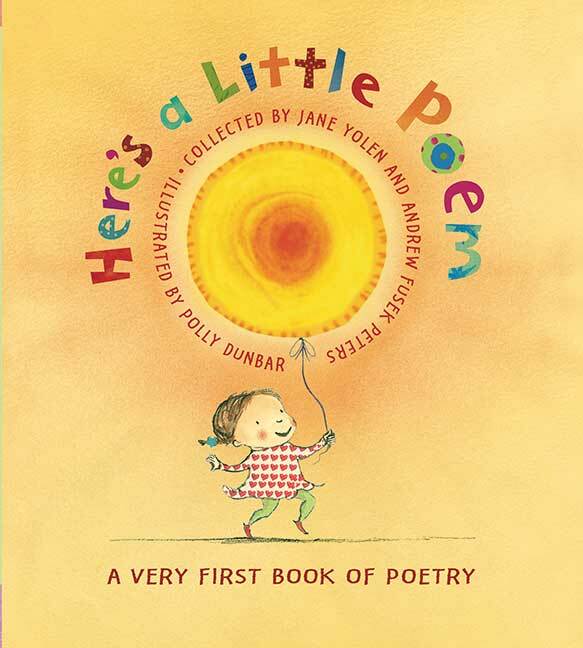 And most everyone has seen Here’s a Little Poem, the anthology from Candlewick that was compiled by Jane Yolen and Andrew Fusek Peters. I am Rose and who are you? I am K and who are you? I am K like anything. Which made the poet in me so happy. She had turned the page back to that poem and in her mind, she remembered it with her name. She had seen herself in those words. And she made it her own. Which is exactly what I’d hope for in a poem, or a poetry collection, or a book. To all of you who are headed to LA for the SCBWI conference, enjoy! And learn a lot! And come back and share all about what inspired you!